I became involved in the whiteboard animation project after Marisha from the INVOLVE Coordinating Centre saw me give a presentation at a Great Ormond Street Hospital event in October 2013. Following my diagnosis of Hodgkin’s Lymphoma at the age of 18, I had become passionate about being a representative for teenagers and young adults with cancer, especially given the enormous difficulties I faced both during and after my illness. An advisory group was formed with me, Christine and Carol, who are both INVOLVE Group members. I was invited to join the team as somebody who had experienced ill health at a young age and then got involved in health research as a result. We agreed to use whiteboard animation, which combines a voiceover with pictures drawn on a whiteboard. This was a new concept to me and but I soon realised its potential. It was great to be able to meet and then work with new people, sharing ideas and experiences. We had to figure out how we could engage young people, while also getting our message across. The initial script was basic, but it developed as we moved forward. There was a sense of eager anticipation as we waited for the next drawings to come through from the animators. 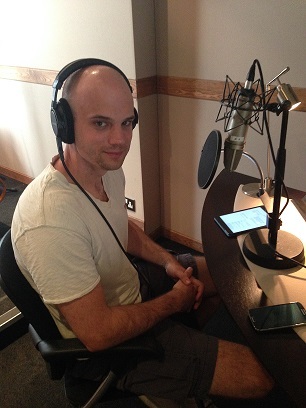 I even got to head to a sound studio in London to record the voiceover – I felt like a pop star! I could never have imagined at the start that the animation would turn out the way it has. I hope it provides a medium to chart the story of someone who got involved in research for the first time, how they found the experience and what it meant to them. In essence a journey – from being new to research to becoming meaningfully involved. My own journey was difficult but out of it came some wonderful chances to get involved in health research and make a difference. I hope this project can show other young people just what is possible.